The truth is stranger than fiction, or so the saying goes. The best stories have already been written in the annals of history, so it's up to the playwright to dig them out and bring them back to life. But how do you condense a 2½ year journey into 2½ hours? How do you cross the massive Rocky Mountains inside a theatre? How do you tell a story overflowing with myths and legends and still be true to real events? Most of all, how do you recreate an expedition that left behind very little hard evidence? These were the questions faced by playwright Leon Martell as he began writing Beautiful in the Extreme, a world premiere about the Lewis and Clark expedition which opens October 19 at The Colony Theatre. A prominent local playwright, Martell is well-known for his passionate plays and musicals based on historical events. His recent world premiere musical, Steel: John Henry and the Shaker, has been nominated for 7 Ovation Awards including Best New Musical and Best Musical (Smaller Theatre). Colony Literary Manager Wayne Liebman recommended Beautiful in the Extreme to Producing Director Barbara Beckley two years ago. Upon reading a rough draft, Beckley knew that it was a project she wanted to pursue, and agreed to produce the play during The Colony's first full Equity season. Martell, a playwriting professor and history buff, didn't know much about Lewis and Clark until his wife gave him a copy of Stephen Ambrose's Undaunted Courage. He instantly recognized the theatrical possibilities in the story of two men and their quest for the West, and he promptly set out to learn more. Lewis & Clark were two of this nation�s first real heroes, overcoming impossible odds and risking their lives to open up an entire new world, and to write history. But how much do we really know about these two men, whose names will forever be linked, who embarked on the most incredible journey of their time? Martell discovered that there was much more to the story than our history books tell us. And five years after devouring thousands of pages of reference materials, scouring the journals kept by Meriwether Lewis, reading every book ever written on the expedition, and actually traveling to Montana to follow in their footsteps, Martell produced a script of incredible strength and beauty. The title, Beautiful in the Extreme, is taken from Meriwether Lewis's description of his first view of the Great Plains. The play is not only a glimpse into the daily experiences of the trip, but is also an examination of the inner demons that haunted Lewis throughout his life. This is a man who, despite his achievements, still felt like a failure, which is something Martell feels audiences can understand. "He's a personality that people can relate to now because he's an overachiever who sees himself as a failure....I think Lewis is a kindred personality...someone who works so hard, but only sees the things he didn't do or the things he did wrong." The play delves into Lewis's psyche as he flashes back to his famous journey, and we see the events through his eyes. Martell stresses that the play is not an historical re-enactment of the expedition, and prefers to call it a �re-imagining.� When asked how much of his play is true, he responded, "we don't even know for sure." Characters in the play are based on real people, some famous, like Native American legend Sacagawea, and some not so famous. But they all are vibrant figures in one of the seminal historical events in our nation's history. Directed by longtime Colony member David Rose, the play is full of challenges, but rich with possibilities. Rose had no blueprint for re-creating an 8,000 mile trip on a small stage, so he encouraged imaginations to run wild. Production design elements, something The Colony is famous for, were called on more than ever, and he challenged The Colony's talented designers to design a set, lights, sound, and costumes that would set the tone and create the environment for the journey. 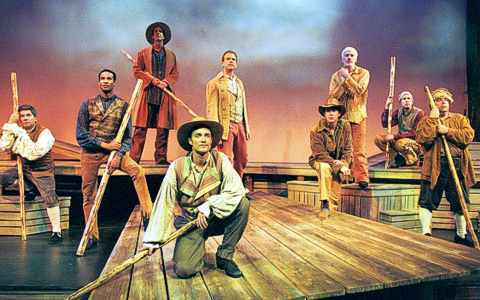 Realizing that this theatrical, movement-oriented side of the show is crucial in the telling of the story, Rose brought in choreographer Ameenah Kaplan to orchestrate the ballet that would become the Lewis and Clark journey. Kaplan was an original member of the cast of STOMP!, the landmark rhythmic show that swept the nation. Her infusion of rhythm and movement into the show takes it to another level, where, according to Martell, �meaning and gesture are totally wedded. In the theatre, that's a wonderful thing." Beautiful in the Extreme promises a journey unlike any other and we hope you enjoy the ride. Beautiful in the Extreme performs Fridays through Sundays, October 19 - November 17, 2002. Call (818) 558-7000 for tickets. Due to intense subject matter, Beautiful in the Extreme is appropriate for ages 12 and older. After striving for 27 years to produce high-quality shows at a professional level, The Colony's efforts were rewarded on September 29 when the annual Theatre LA Ovation Awards nominations were announced. In our first year as an Equity theatre, The Colony received a total of 15 nominations, second only to the Mark Taper Forum, which garnered 16 nods. The Ovation Awards, the only peer-judged Southern California theatre awards, are highly respected and generally perceived as the most prestigious awards in town. Prior to this year, since the competitive Ovations were conceived in 1994, The Colony had received 22 nominations, winning 6, including Best Musical (Smaller Theatre) for City of Angels in 1996 and On The Twentieth Century in 1997. This is the first time that the Colony has been recognized for three different shows in the same year. Side Show, the Colony's blockbuster musical about conjoined twins Daisy and Violet Hilton, garnered 8 nominations including Best Musical in a Larger Theatre. The Laramie Project, our Los Angeles premiere of the riveting drama by Moisés Kaufman and the Members of the Tectonic Theater Project, nabbed 5 nominations including Best Play in a Larger Theatre. Our musical, You're A Good Man, Charlie Brown, brought home 2 more nominations. The Awards ceremony will be held on Sunday, November 24 at 5pm at the newly restored Orpheum Theatre in downtown Los Angeles. The Colony has booked a block of tickets for the event and you may purchase them through us by calling (818) 558-7000. Tickets are $35 each and must be purchased by October 25. After that, tickets may be purchased through TicketMaster. Join your Colony family as we cheer on our nominees and celebrate theatre in Los Angeles! 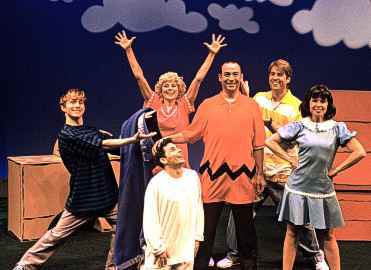 The Colony�s production of You�re A Good Man, Charlie Brown was yet another rousing success for the company known for its crowd-pleasing musicals. After a tremendously successful run , the icing on the cake turned out to be two Ovation nominations for the show. Rod Keller, who played Linus, garnered a nod for Best Featured Actor in a Musical, while Beth Malone was nominated for Best Featured Actress in a Musical for her memorable performance as Sally. But perhaps the proudest legacy left by the show was the number of families who attended. For scores of children, this was their first live theatre experience, and that was the best reward of all.